Best for doggy day care: Spot! 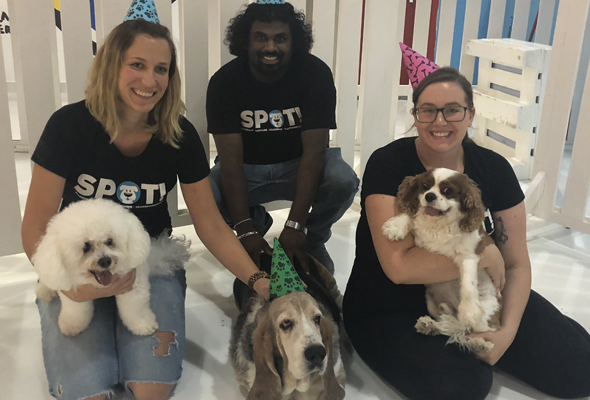 Dubai’s newest doggy day care is only three months old, having expanded on their success in New York. Services offered here include boarding, day care, and grooming. Not to mention the exclusive brunch bus service, which allows you to drop your pooch off in the morning, have a few drinks and your pet will be dropped off just in time for when you get home. Dogs are kept entertained by live music, birthday parties and a bubble machine. The crew take regular quizzes to ensure they know each and every dog by their name too. For dog owners, there’s nothing worse than leaving your best friend home alone in while you’re out and about, which is exactly where the guys from HomeMyPet come in. They offer dog-sitting services – in their home – so your pooch will feel snug as a bug. All the borrowers are vetted and rated – think Uber but for dog sitters – meaning your best friend is guaranteed to be in reliable hands. What’s more, it’s completely free to sign up and there’s no annual membership. The last thing you want when you’re going on holiday is to feel guilty about leaving your beloved dog behind. At Woof, the dogs are treated so well they’ll probably have a better time than you. Dogs have access to both indoor and outdoor areas to run around and play, along with their own private kennels to relax in. Owners are encouraged to ‘try before they buy’, as Woof offers a trial run before making any booking, to make sure your dog fits in with the rest of the gang. 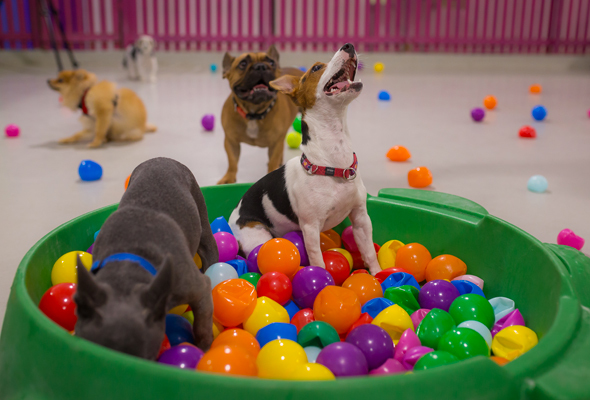 Dogs love nothing more than playing, and Daphne’s Play Centre offers superb facilities for your pooch to get the most out of games and activities. The one-on-one activity games keep the dogs entertained, with different levels of difficulty. Level one includes a puppy training game, where dogs are rewarded with treats; level two tests the dog’s intelligence, which also teaches the dogs how to behave. Top-level activities see the dogs need to work out how to reach treats placed on top of a strategy tower. The centre also has a huge open space for your pet to run around in. MySecondHome boasts the world’s largest indoor dog park, as well as facilities for pampering your pooch. For the energetic dogs, there are both indoor and outdoor swimming pools to enjoy. There’s also an on-site dog groomers, so your pooch can get a trim after a long day lounging by the pool or watching the big screen TV. Other services offered include behavioural training, day care and boarding so whatever your need MySecondHome will have you covered. The only problem you’ll have here is convincing your dog to leave. In the age of social media, your dog’s always got to be looking the part and this family-run business is at your bark and call. They’ve been grooming dogs for more than ten years in Dubai and have built a solid reputation with their mobile service. Your pooch will be looking ready for a night on the town without ever leaving your house. Shampooch only use natural shampoos and conditioners on animals and also offer grooming at a custom-built salon. Dogs can also be left overnight at the boutique hotel. Opened in 2010, Urban Tails was one of the first pet resorts of its kind in the region with fully air-conditioned accommodation and live webcam access so you can keep a close eye on your doggo while you’re away. The resort also plays music throughout to relax the dogs after a long day of playtime. Urban Tails offers a wide selection of in-house food to suit all breeds. For cat owners, you can also check your kitty into a condo from 9am. 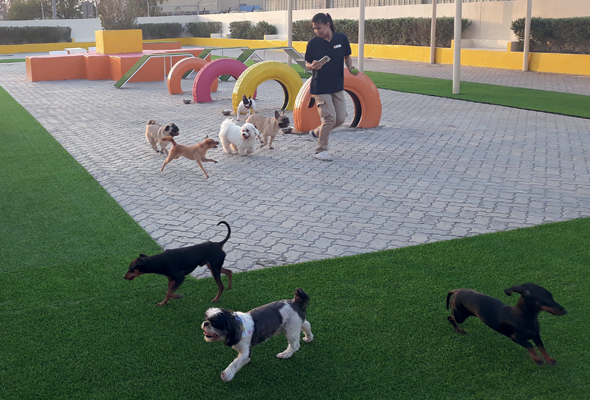 One of Dubai’s most trusted doggy day care centres, Paw Parking screen each pet for suitability in a group play setting before allowing the fun to begin. 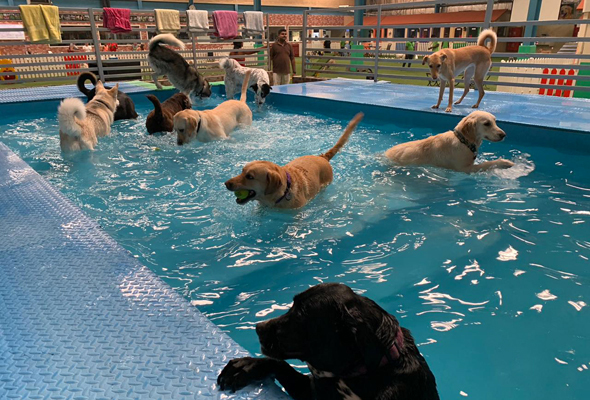 Their vetting process ensures safe play for all the dogs and their highly trained staff supervises all social groups to ensure each dog is having fun and staying safe. Services here include grooming, training, day care and boarding as well as tick baths, de-matting and teeth cleaning so your dog will be perfectly pruned by the time they come home. If you’ve adopted your dog and want to ensure they’re properly housetrained Positive Paws the place to be. Positive Paws offers help and rehabilitation for dogs that haven’t had the easiest of times. They pride themselves on helping the health and happiness of every dog that comes through the doors. Boarding, day care is offered along with Animal Reiki. This is a form of energy transference that allows the body to activate it’s own natural process of healing, thus the nature of Reiki energy is one of connection. Dogwalk stand out from the crowd thanks to their doggy workshops, which stimulate your best friend’s mind. The dogs benefit from off-leash training and socialising in the special enrichment room. What’s more, there are fitness exercises to keep your dog in shape including swimming and weight-loss programs tailored for each dog. Pets not only lose weight improve their cardiovascular endurance, muscle strength, flexibility and body composition.